I LOVE fresh blueberries! Growing up I was fortunate to live next door to my grandparents and they just happened to have a huge blueberry patch. We spent hours and hours out in the summer heat filling our buckets full of delicious berries. I may not have seen it as all that fortunate back then ;) But now I will gladly spend several hours picking those yummy berries and then freezing them so we can enjoy them all year long. After moving several states away, I went on a hunt for a pick-your-own blueberry patch and found one! Lucky for me it's very reasonably priced as well. Before freezing all of the berries I had to make this pie with some fresh ones, yummmmm. 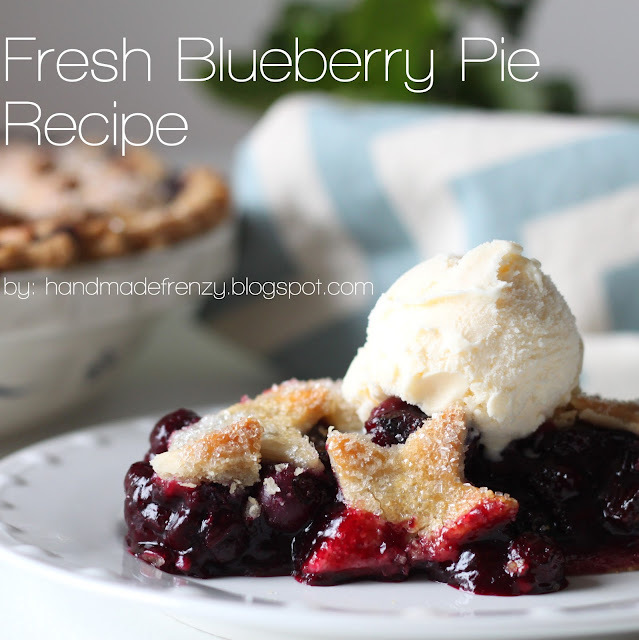 The great thing is though, this pie can be made with frozen and unthawed berries just as well. And the recipe is so easy! You won't believe it. Sometimes the simplest of foods really are the best. Let's cut into it already, shall we? You MUST. Really. You MUST. Serve this warm with some vanilla icecream. You must. Look at all the yummy berries! But believe me. This pie is worth every berry. Prepare your crust. I use Martha Stewart's Pate Brisee recipe, however, I don't usually chill it before rolling it out unless I don't plan to use it right away. Pour filling into prepared crust. Top with crust stars. Brush top crust with beaten egg and sprinkle with sanding sugar. Bake at 400* for 15 minutes. Reduce heat to 350*, cover crust edge with tinfoil and bake an additional 30-40 minutes or until crust is golden brown and filling is bubbly.